Each week Americas Cardroom funds a free progressive rake race promotion for cash game players. Known as ‘The Beast’, previously players paid an extra rake drop to fund the prizepool but the Winning Poker Network (WPN) made the decision to remove that in 2014. 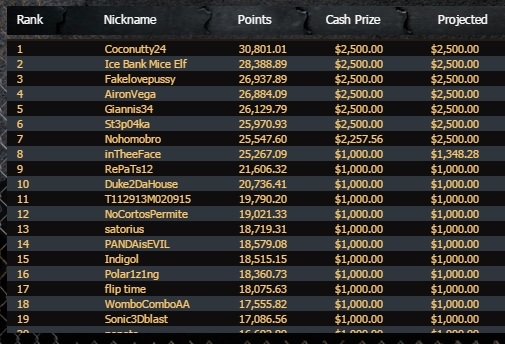 If you’re a high volume grinder and make it onto the Beast leaderboard (top few hundred cash game rakers) WPN rewards you with a large prize just for playing cash games. Over $40,000 is given away every week. 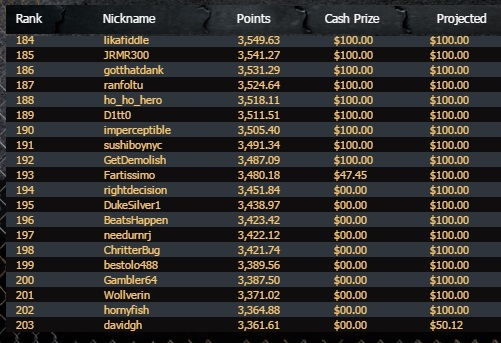 Simply play cash games and rake enough to feature on the Beast Leaderboard. The larger the prizepool gets, the more places are paid out. The Beast race runs weekly from 12:00 ET Saturday – 11:59 ET Friday. Payouts are made on Mondays for the previous week’s Beast race. 1 point is earned per $0.02 a player contributes to the Beast prizepool. The rake players normally pay is used in part to fund the Beast prizepool. This has no effect on the 27% rakeback you receive by signing up via an affiliate such as Rakeback.com. WPN run a separate progressive rake race for tournament players, called ‘Sit & Crush’. To see the Beast leaderboard simply click ‘leaderboard’ in the top right of the poker room client, of whichever WPN skin you’re playing on. There’s no limit on the total number of players who can receive prizes, although it tends to be in the range of a few hundred players. 25% of the prizepool each week is used to seed the following week’s Beast race. First place is capped at a $20,000 prize to allow more players to earn cash. 13% of the prizepool is allocated to the top 20 rakers. To date The Beast has awarded over $4m in cash prizes to players on Americas Cardroom and other WPN rooms.